Two of our higher handicapers took the bold step to support Hamptworth's new C-Level tournament enterprise today. The event for handicaps 7+, attracted Diane Brown (7) and Philip Allison (9), and full marks to them for 'having a go'. Dianne won all three of her morning matches to qualify for the top group after lunch, from where she finished a creditable 3rd overall. Philip, entering his first ever 'outside' tournament came in 12th. Well done the pair of you. - Who is going to be next? PCC cruised to a comfortable victory today against Camerton & Peasedown by 5.5 to 1.5 games in the poring rain. Courts 1 and 2 were fully waterlogged by lunchtime and the match had to be concluded on the smaller courts 3 and 4. PCC held a good lead by lunchtime, thanks to straight games wins in the doubles by Chris Roberts and Helena Fensome, and Ian Norris turning the same trick, but in two very tight singles games. Mike Fensome's singles rubber was halted at one game all, with the intention to only play the decider if the match result rested on it (and in the end it didn't). In the afternoon, Roberts, Norris and Mike Fensome all won in straight games, but Camerton & Peasedown's Mo Boyes salvaged something for their side by defeating Helena Fensome in the deciding game of three. A very satisfactory start to our Club's competitive season all told, and with our next opponents known to be Cheltenham, the next job will be to fit them in to our busy domestic programme. (1) To protect the 'start corners' of Courts 1 & 2 - for social play, including 'all comers', please play your first shots from within the court but between the two new paint marks on the boundary line (they are clearly marked). Please don't stand in the corner waiting your turn, because that wares that are too (thanks). Competitive matches should start from the usual place. Courts 3 & 4 don't get so much ware, so start normally on those. (2) From 1530 onwards, those in play may continue on to play a 13 hoop game if they wish. However, please be mindful if someone is waiting to join in with your foursome - only play on to the 13 hoop course, if it doesn't cause a waiting person to be left out. Please remember - in a foursome: The strongest player partners the weakest verses the other two. Congratulations to Helena Fensome who has qualified as a coach following attendance at a course at Hamptworth. 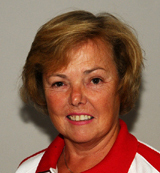 Her qualification is very timely as she now joins existing coaches Frances Colman, Don Rutherford and Chris Roberts who will soon be jointly undertaking the training of 20 new beginners. 4 April 2016 - Beginners training starts today - 20 new players in next two weeks! Beginners training is taking place in the mornings and afternoons of four days this week under tie tutorship of qualified coaches Frances Colman and Chris Roberts. And next week, Helena Fensome and Don Rutherford will be running classes in the mornings only. 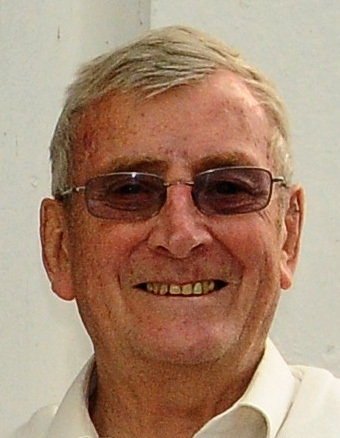 The funeral service for Club doyen Bill Eades took place today at Bix Church and afterwards back at the Club (see below). There is a busy week ahead with more beginners training and session for 'handicap team hopefuls'. Friday - there is a big match at home - which will be a good one for those that like to support and spectate. Our strongest team available play a first round tie in the GC National Inter-Club Championship against Camerton & Peasedown CC who hail from near Bath, and are first time visitors to Phyllis Court. The action starts 1030, breaks for lunch and then concludes at about 1530. Monday - The GC Handicap Singles Tournament on Monday - sign up in the pavilion NOW! Tuesday - sees our first game in the GC National Inter-Club 'Murphy Shiled', when our team will travel to High Wycombe. Starts at 1330. 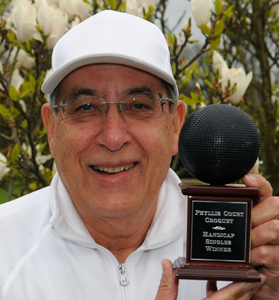 In the closest Handicap Singles Tournament yet, as others faltered, Roger Goldring held his nerve to win the 'Black Ball' Trophy for the first time. Going into the last round Dianne Brown and Don Rutherford were both tied with Goldring on games won, and Ian Norris was still 'in the mix' but needing all three of his rivals to loose. But of the leading trio, only Goldring was able to win his last round game, and so was a clear winner without the need for the 'who beat whom' rule or an additional play-off. Norris won his last game too and so tied for second place with Brown and Rutherford (they could not be split as all had not played each other, in this Swiss style tournament). ALL FOUR DULY QUALIFY FOR THE AREA FINALS OF THE GC ALL ENGALND HANDICAP (a national competition). Earlier in the day Colin Morgan had shown well, but his results faded later on, Sylvia Thomson made a welcome return to competitive croquet, and full marks for our highest handicapper Geraldine Clayton for supporting the event and 'giving it a go' - thank you. Congratulations to Ian Norris, who came equal second in the tournament above, but earned enough handicap points to 'trigger' a handicap change to 'zero'. Well done for making it to 'scratch' Ian - a milestone achievement. Hot on the heels of Friday's National Inter-Club Championship win, Phyllis Court did it again today in the second tier 'Shield' competition! Our Murphy Shield team won at High Wycombe by 5 rubbers to 2, with unnecessary games being left un-played and matches halved once the fixture result was clear. We had a hero before play even started when Hugh Crook dropped everything to answer a desperate call-up to the team in the mid-morning after Mary Gaynor dropped-out ill. The early afternoon start ensured that play went on into the early evening and what a corking day it was, with glorious sunshine streaming from a cloudless blue sky. Raymond Wood won his singles in two games but Wycombe's up and coming Andy Baker levelled the match with a win in the same fashion over Crook, despite the latter's efforts at hoop 13. A very long doubles encounter eventually went Phyllis Court's way in straight games with Frances Colman and Roger Goldring's tactical nouse providing separation from the accurate long-clearances of Richard Peperell and another rising player Keith Pound. Phyllis Court lead 2-1 at the halfway stage and strengthened their grip on the tie when Wood and Crook both took the first games of their round two singles. Crook scored his own 13th hoop victory to competed his job against Geoffrey Duckworth, to extend the visitors lead to 3 -1, and it looked even better when Colman went one-up against Pound. Before Goldring could complete a great come-back against Peperell, winning five of the last six hoops, Wood secured the fixture result for Phyllis Court with a 2-1 win over Duckworth. This rendered further play unnecessary and the call of the pub next door was too strong to resist. High Wycombe were very good hosts and they now boast a lovely two court facility with newly erected wooden pavilion which looks very smart indeed. 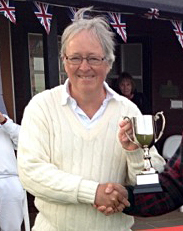 Congratulations to Frances Colman, who's single game win triggered a handicap change to an 'new low' of 2. Chris Roberts just failed to a score second National Singles Championship (Ascot Cup) Qualifier title this weekend when he finished runner-up to Ramsgate's international player James Goodbun at Surbiton. 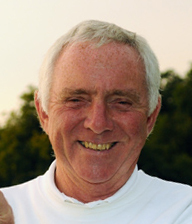 Phyllis Court were well represented with Charlie von Schmieder, warning up for the World Team Championship (also at Surbiton from 15 May) when he will be in the Ireland team, and Roger Goldring making his first appearance at this, the top level of UK GC. Charlie won 6 of his 11 block games which was good return give the standard of the field and Roger scored a fabulous victory over the eventual winner Goodbun (which is a 'scalp' in anyone's books). Goldring won two more games in a very loose Plate event and so ended with three wins that pre-tournament seeding show unlikely - so well done Roger. 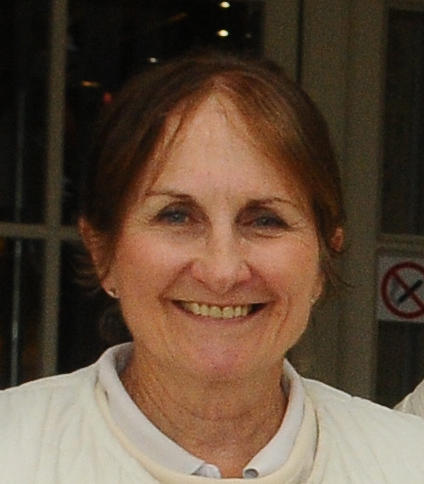 PCC's Helena Fensome was delighted to get a call up on day 2, and she managed to play four games as cover for a retiree. Roberts had a great first day, beating five higher-ranked players and losing only one game in seven. He then slumped badly on the morning of day two but qualified for the semis anyway, to beat another international Jamie Burch, before coming up just short in the final. 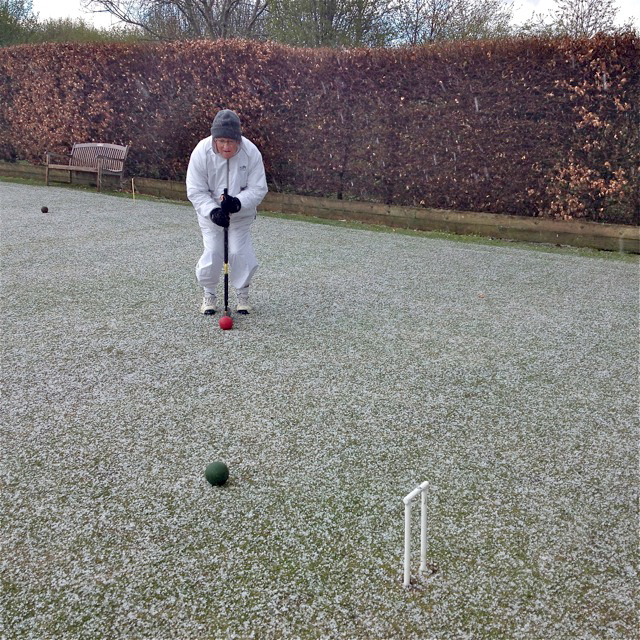 A great weekend for our players, further cementing the Phyllis Court name on the competitive croquet map. Chris Roberts retained his Sidmouth GC Open Title the past weekend on the Dorset Coast, where there was very nearly an all Phyllis Court Final for the first time ever at the National Championship Level. Roger Goldring pulled off a string of victories against much higher ranked opponents to sail through his block in this only his second ever appearance at this level. It is really quite something to 'make the cut' into a knock-out stage so soon after stepping-up his career to tackle unrestricted events. He went one better than that in then winning his quarter-final tie before being undone by the very experienced Tom Weston in a time effected semi. But getting to that stage gives Roger a good chance of qualifying alongside Roberts for the English National Singles Championship (Ascot Cup) Finals at the end of the season. Helena Fensome had a disappointing first day and failed to qualify in the top half 'cut' but she bounced bake to win the consolation plate event which was run (unusually for GC) as an Egyptian event. Roberts won all his knock-out matches in staright games and survived peeling Weston through hoop 11 in the final to retain the Haste Cup he won in 20I5. Raghu Iyer pipped Philip Allison to the 2016 Charity One Ball Tournament crown, which this year is supporting bone cancer charity Myeloma UK. The pair ended on five wins each from their six games for an 88% winning ratio, but Iyer had the 'head to head win' so took the title on that basis. But the big winner was this year's chosen 'croquet charity' and we have raised £100 so far from the ten players donations and a further £50 from a non-playing doner. You can add to our collection with your own donation, in either Chris Roberts' pigeon hole or the 'orange' collection jug in the pavilion ~ your contributions will be gratefully recieved. Iyer and Allison duly qualify for the National Charity One Ball Final at Surbiton on Sunday 8 May. As Myleoma UK's 'house colour' is orange, all the players were suitably clad throughout and winner Iyer on a Terry's Chocolate Orange! 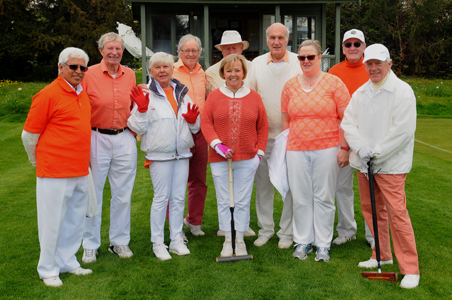 Phyllis Court 'A' we far too strong for Littleton in today's opening Level League match. Our side won convincingly by 6.5 rubbers to 0.5. It was a bitterly cold day and, as Helena's photo shows, at one stage there was a carpet of hail stones!